Gamelan Genta Kasturi, Kansas City’s community Semaradana gamelan ensemble, is one of the 2013-14 Charlotte Street Urban Culture Project Studio Residents. The group has brought a guest artist from Institut Seni Indonesia (ISI) Denpasar, Bali, I Made Kartawan, to tune our gamelan instruments and teach the ensemble. Pak Kartawan is a composer, tuner and master gamelan musician. 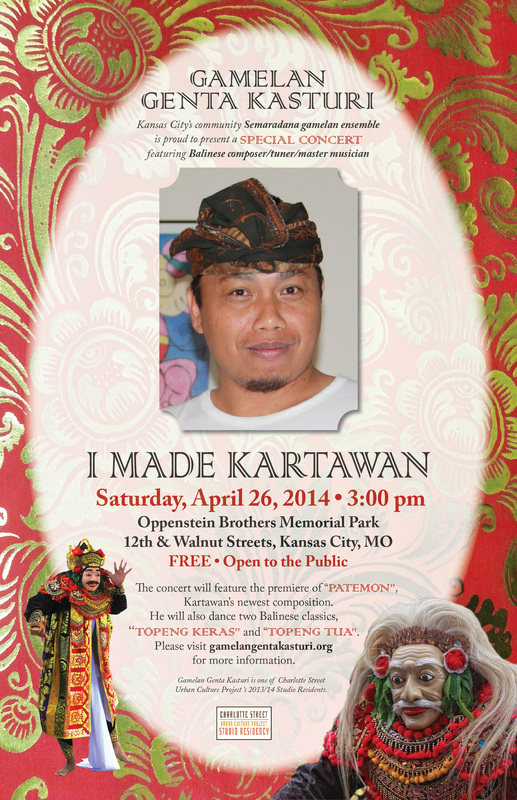 Gamelan Genta Kasturi, under the direction of I Made Kartawan, will present a special concert on April 26, 2014 at 3pm in Oppenstein Brothers Memorial Park located at 12th & Walnut in downtown KCMO to close the 2014 Charlotte Street/Urban Culture Project Studio Residents Annual Open Studios Weekend. The concert will feature the premiere of a new composition written for the group by Pak Kartawan, and feature him dancing two classic numbers, “Topeng Keras” and “Topeng Tua”. Pak Kartawan’s new creation, “Patemon”, explores the variety of modality available on our Semaradana gamelan set. Make a donation and receive a free copy of our CD "Kembang Anyar".